MONDAY was quite the “red-letter” day for me. 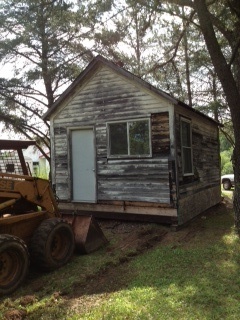 Started out fantastic as my old bunkhouse was moved from it’s original spot to a more picturesque one. It has been on the back-burner for more than two years so when it finally happened, I was thrilled! Here is where it sat since it was built who knows when. Next to the windmill and maybe 25 feet from the house. Over the years, I have used it as a school house, a craft studio, a storage shed and Scott even planed wood in it (which once sent a board flying out of the planer and through the window sill….good times…). Two years ago, I asked Scott if we could move it to the nice little “park” setting we have between our two driveways. Of course, by “we” I mean “him”. My husband as many of you know is part saint. I often throw these wild ideas at him and expect him to jump right on them. I think I take the title of “Queen” a bit too literal! He had wanted to move it years ago, but more toward the back of our property while I wanted it up closer to the road for the “cuteness” factor. So, like most things I want, he gave in and said I could have it where I wanted it but it would take some time to get it ready to move….two plus years later, a kind neighbor came over with some kind of big tractor and drug it over to the new setting. The “park” like setting between both driveways. The move was not without drama. 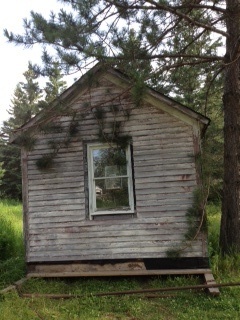 Eventho the bunkhouse is small, 12×14, it was made to last and it was HEAVY. 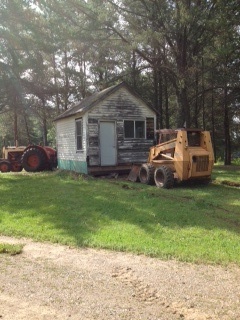 So anytime the tractor encountered a bump, it could not pull it over, so Scott had to run across the road and borrow our neighbor’s skidsteer and push the house while the tractor was pulling it. Lest you think it was clear sailing, I need to tell you that the house had to go between the Airstream and my school bus and it was only eight inches away from the Airstream and a huge beam that Scott had put in the ground for his garage addition had to be pulled up so the house could get by! Then it has to make a turn and go up hill a bit. It got hung up on some branches of a tree and being a red-neck, my husband stood in the bucket of the skidsteer and had the other guy lift him and his chainsaw up to the top of the house so he could saw the branches. I think I saw an episode of “1,000 Ways to Die” like this! Once they cut the branches down they took on the little hill and the tractor man was backing up the skidsteer and didn’t realize that he was going to go into the ditch and I heard him yell, and I looked over and the skidsteer was vertical and I could just imagine it crushing him but by the grace of God, he righted himself (bet he had to change his skivvies) and they got it pulled into place. Sort of…. I have this weird quirk that I think has something to do with my inner ear liquid but if some things are not placed, “just so”, I get dizzy looking at it. Seriously. So when I stood in front of the house, it was off just a foot or so….so how to you tell two men who have worked their butts off, that the house needs to be moved just a foot more to the left? Did I mention that I was married to a saint? So after the other man left with his giant tractor, Scott rigs up some kind of cable and winch (“To the winch, wench”! Who knows what movie that is from??) and he moves the building over a foot and back about three! The man is awesome. Meanwhile, I am standing around waiting to be called upon to help (not normally my line of business, but even I have some feelings of responsibility! ), I decide to pull some 6 feet tall weeds that are growing in my perennial garden. I had gloves on but a short-sleeved shirt and as I was yanking those weeds out, they were stinging my right arm but I figured I would be done in no time and would wash my arm off after. HAH….I don’t know what those weeds were but within five minutes of pulling those weeds, I had BLISTERS all over my arm and my mouth and tongue felt like I had just eaten the skin of kiwi’s….kinda tingly and the feeling was going down the left side of my throat! You know history shows us that many folks of royal blood have these odd allergies and maladies and since I am a Queen, it makes sense that I, too, should have some. I quickly downed a fake Benadryl and washed my arm off with dish soap and applied some aloe from one of my many aloe plants (they are as prolific as bunnies). I thought about telling Scott to Google how to do an emergency trach, but the man can’t even clean up dog vomit without passing out (almost) so I figured if my throat closed up, I would have to either do it myself or die. I did wonder what it would be like to have your throat close up and if you felt it closing could you grab a piece of PVC pipe and stick it down your own throat? (I have a really graphic imagination…). So later Scott goes to work and I settle down for a night of Season six of CSI and pretty soon my stomach starts to swell up and that alien from the movie tries to claw it’s way out from under my right rib….the pain is excruciating and nothing I eat (because if you have a stomachache you should try to feed the demon inside, right???) is helping. Pretty soon the pain has also gone into my back and I swear something is going to pop out any second. Then it dawns on me that maybe I am having a gallbladder attack. So I Google it and sure enough, I have all the symptoms. By now, I have the chills, and my mouth keeps watering (puking is my all-time FEAR…big time…beyond phobic) and I am desperate to find a remedy. I read that eating a handful of lettuce will help, so I crawl (almost) to the fridge and grab some lettuce and chow down….nothing. The only other thing I have in the house that it says might help is Apple Cider Vinegar and Lemon juice. Thing is…last time I had an attack (which I had thought was food poisoning…nay, nay), I drank some ACV and promptly threw it back up (first puke in 50 years and it was as awful as I remember)so I was not keen on a repeat performance but I thought if I mixed it with warm water and lemon juice it might be Ok….NO, it was not ok….two sips and my stomach tried to refund my deposit. I was chewing Lorazepam like candies trying to calm myself down or at least get myself to the point of not caring if I puked. I decided to try some Ibuprofen and I don’t know which kicked in but finally I could feel the pain starting to ease up and I slept on the couch with a garbage pail next to me and woke up in the morning feeling fine. I now live in fear of fats……and of Apple Cider Vinegar. Any body know of a gallbladder cleanse that doesn’t involve drinking olive oil cause ain’t no way that would stay put in my stomach…ew…….